This is a screenshot of a portion of the list. Many people use Gmail for person and business use. I know many of you use it because it’s free, easy and reliable. Here’s the deal – about 5 million Google accounts and passwords appear to have been published on a Russian forum. 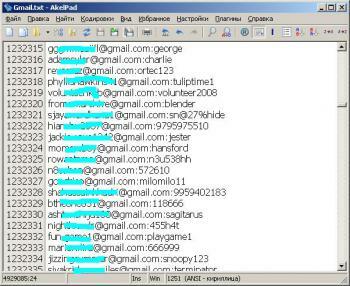 Some of these seem to be old/invalid accounts, but the hacker claims that at least 60% of the information is valid. So if you use gmail, you need to take action, but don’t panic. The first thing you can do is check to see if your account is on the hacked list. You can check to see if your account is hacked here. Just input your email address and it will tell you. you do NOT have to put in your password here (never put your password into some random site that is asking for it!). Whether or not your account was included, you STILL ought to change your password, just to be safe. Google is so big, it’s a constant target for hackers. So it’s a good idea to change your password frequently anyway, as inconvenient as it is! The third thing you should do, especially if you are particularly concerned with security, is to enable 2-factor authentication on your Google/Gmail account. Sounds fancy, but it’s really easy. 2-factor authentication is basically a 2-step process for logging in where you enter your password, like you normally do, but then you also enter a passcode that is different each time, that is sent to your phone via text, voice or on a mobile app. It’s definitely a good idea, but obviously is a little more time-consuming. Here’s more info about it and how to turn it on. Let me know if you have any questions or problems, and I hope none of your accounts were affected!